Hull Minster is celebrating record-breaking visitor numbers in 2018, as the iconic church becomes established as a leading events venue. During the year 225,000 people visited or attended events at the Minster as the rejuvenated church capitalised on the transformation of the building to enable it to host flexible and inclusive forms of worship and become a major social, cultural and community hub. The numbers are a significant boost as increasing visitors and donations are both vital in the Minster’s continuing challenge to raise the substantial funds needed to meet high running costs and establish a sustainable future. Highlights of the year included two extraordinary installations, The Museum of the Moon, and Ship of the Gods, when the Minster recorded attendances of 82,000 and 25,000 people respectively. 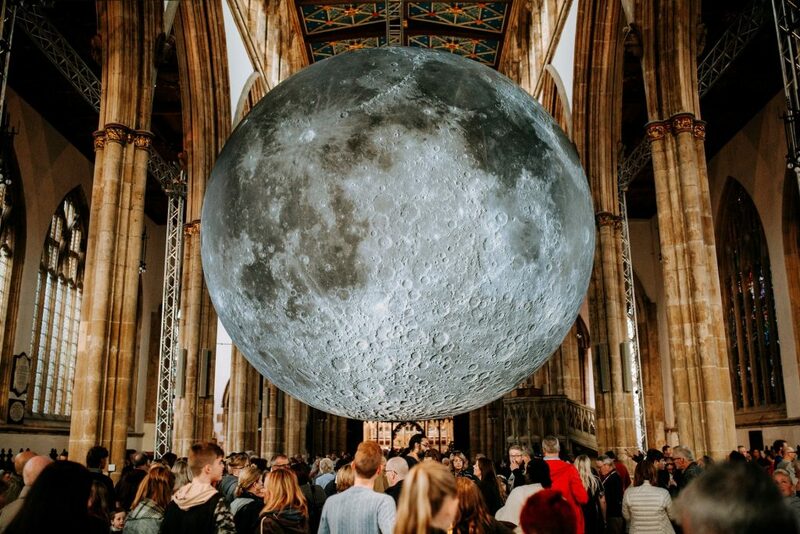 A fusion of lunar imagery, moonlight and surround sound, The Museum of the Moon was a touring artwork by artist Luke Jerram and was brought to Hull Minster through a partnership with Hull’s Freedom Festival and the British Science Association. The spectacular installation was a hit with people of all ages as a highlight of the Freedom Festival from August 30-September 2 and continued to attract crowds to the Minster until September 15. Heinrich and Palmer’s Ship of the Gods combined film, 3D laser scanning technology, sound and lighting effects to create an ethereal and otherworldly experience at the Minster. The installation was staged in partnership with Absolutely Cultured as part of the Urban Legends: Northern Lights event at key locations in Hull city centre. Ship of the Gods was staged inside the church from November 29-December 1, before moving outside into Trinity Square on December 2. A further 20,000 people visited the Minster from October 30-November 25 while the church hosted Coming Home, a powerful remembrance installation by artist Martin Waters made up of thousands of poppies marking the 100th anniversary of the end of World War One. The visitor numbers for 2018 are more than three times the 70,000 who came to the Minster during Hull’s year as UK City of Culture 2017 when the church hosted several cultural and artistic events. They also mark a dramatic increase over the past few years. In 2010 just 14,000 visitors were recorded when the then Holy Trinity Church was at its lowest ebb before the launch of a transformational £4.5m development project. The Minster’s clergy and staff had hoped numbers could reach 100,000 in 2018 as the church hosted an ever-growing number of events, but the final total for the year has exceeded all expectations. The figures don’t include congregations for regular services, which have also grown in recent years, or bumper attendances for the first Christmas services in the remodelled Nave. The Vicar of Hull Minster, the Reverend Canon Dr Neal Barnes, said: “We’re absolutely delighted with the visitor numbers. It’s an amazing advance on where we used to be and a great tribute to the work of all the clergy, staff and our volunteer welcomers. “The figures reflect the significantly increased visits from both local people and tourists and the terrific range of events we are now staging. It all means more footfall to support the renaissance of the Old Town and boost trade for businesses in the area. Canon Barnes added: “The huge increase in visitors been made possible by the development project, which has made the Minster a flexible and welcoming place for worship and a broad range of community, cultural and corporate events. “The growing numbers of people visiting and using the church are helping to ensure the sustainability of the Minster, but we’ve still got some way to go to secure our future. The ever-growing visitor numbers build on exciting changes at the 700-year-old church over the past year, including the opening up of the Nave and a new shop, café and visitor facilities. Hull Minster has a busy schedule of events already booked in for 2019, including corporate events, banquets, exhibitions and concerts. Music events over coming months include a return gig by the Steve Harley Acoustic Trio on April 5, following a sell-out show in 2018, with former Zombies singer Colin Bluntstone performing the following evening. The events diary also features a Prosecco Festival on February 16 and the hugely-popular annual Hull Real Ale & Cider Festival on April 11-13. Events staged through the year will also focus on the history of the Minster and the part the church has played in the story of Hull and its people. James Symonds, Hull Minster Events Coordinator, said: “2018 has been a milestone year for the Minster. The visitor numbers are a major breakthrough for our ambition to become established as a premier events space within the city and region. “The partnerships with Freedom Festival and Absolutely Cultured to stage two of the year’s highlights at the Minster have been key to taking the visitor figures to a new level. We want to thank those organisations for recognising the Minster as a unique setting for spectacular events and installations. Organisations interested in booking Hull Minster should contact James Symonds at james@hullminster.org or call the Parish Centre on 01482 224460. 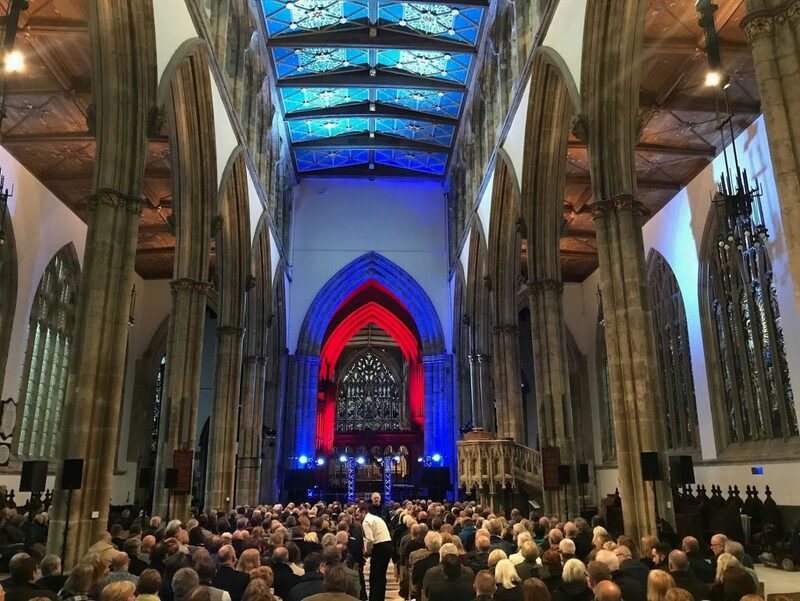 Audience members in the remodelled Nave at Hull Minster before a concert by Steve Harley in April 2018. Changes under the Minster’s development project have enabled the church to accommodate a wide range of performances and events. Be the first to comment on "Visitor records smashed in milestone year for Hull Minster"